Flash20 automates the process of using SCS' TR-20 method for hydrograph generation and routing. 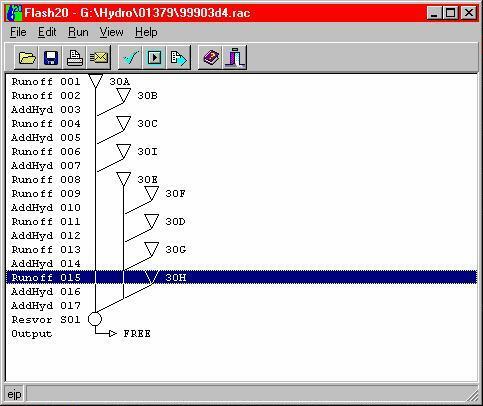 After performing TR-55 method hydrology calculations with Flash55, Flash20 will automatically pick up the data from Flash55 and create a TR-20 input file. You can graphically connect drainage areas, add reaches, diversions, and reservoir routings, and then compute the results. If you have ever created a TR-20 file manually then you know its not a lot of fun. Worrying about hydrograph locations, cross section numbers, and making sure all your data is in the correct columns is a time consuming and error prone task. Modern Graphical User Interface allows you to edit several files simultaneously. Drainage area data is automatically extracted from TR-55 files. Hydrographs are combined and manipulated graphically, on an RPN stack, similar to doing math on an HP calculator. Hydrograph locations, cross section numbers, and other details of the TR-20 method are handled automatically. Flash20 runs on PC compatible computers with Windows 95, 98, Me, NT, 2K, and XP. Copyright © 2004 RAMSS Inc. All rights reserved. Flash55, Flash20, HYDROmate, and the RAMSS logo are trademarks or registered trademarks of RAMSS Inc.
HP48 is a registered trademark of Hewlett Packard.